Israeli soldiers demolished, on Wednesday morning, a slaughterhouse and two sheds in Barta’a Palestinian village, isolated by the illegal Annexation Wall, southwest of the northern West Bank city of Jenin. Media sources in Jenin said the soldiers, and personnel of the “Licensing And Construction Department,” of the Civil Administration office in the occupied West Bank, invaded the area and demolished a Turkey slaughterhouse. They added that the soldiers did not allow the owner, Anan Shafe’ey, to remove his equipment and belongings before demolishing the property. 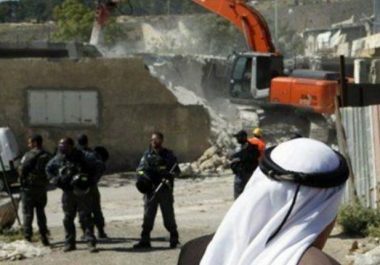 The soldiers also demolished an under-construction shed, and a barn, owned by Mo’tasem Aziz Kabaha and Yahia Rateb Kabaha. The Israeli army said the structures were not licensed by the Civil Administration Office, which runs Israel’s occupation of the West Bank. Furthermore, the soldiers demolished a Palestinian print shop in Ein al-Louza neighborhood in Silwan, south of the Al-Aqsa Mosque in occupied Jerusalem, and demolished a print shop, in addition to abducting two Palestinians after assaulting and wounding them.